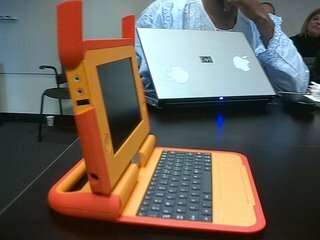 The $100 laptop, first announced by [Nicholas Negroponte, chairman and co-founder of the Media Lab at MIT] at the World Economic Forum in January 2005, is an ultra-low-cost, full-featured computer designed to enhance children’s primary and secondary education worldwide. It is a joint project of the Media Lab and the nonprofit One Laptop per Child (OLPC) association, which aims to equip the world’s school children and their teachers with a personal, portable, connected computer. Some photos of the first prototype have just been posted. To see them, click this link. 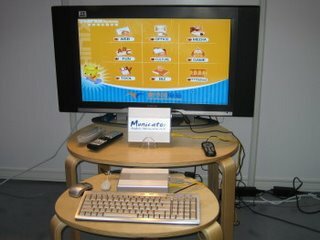 And for those interested in an inexpensive, full sized computer, the attention is on YellowSheepRiver, a Chinese company that released its Municator–a fully functional Linux based PC that will sell for $150 U.S.–earlier this past March at CEBIT Hannover. The Municator, which comes with 256MB of RAM, uses a unique 64-bit CPU with an instruction set based on a subset of the MIPS architecture. Designed by a Chinese company called BLX, the the cheap chip is clocked at 400 or 600MHZ and supposedly provides performance comparable to that of an Intel P3. Unlike MIT’s laptop, the Municator is not designed to be a mobile computer. Rather than using an LCD display, it features support for S-video and VGA which will enable it to interface with televisions and monitors. For storage, the Municator comes with a 40 GB external USB drive and support for an optional external optical drive. With four USB 2.0 ports and built-in ethernet support, the Municator is quite capable of supporting other external devices and connecting to the Internet. According to the YellowSheepRiver Web site, integrated WiFi and a lithium-ion battery pack are also available options. Sharper Edge: Five Tips To Increase Efficiency In The Outer ReachesEdge computing likely takes place throughout your facility, from server closets to branch offices. Making these sites reliable isn’t enough: Energy efficiency must also be part of an effective edge strategy. Latptop is the blessing of science technology. I want to buy this type of laptop.